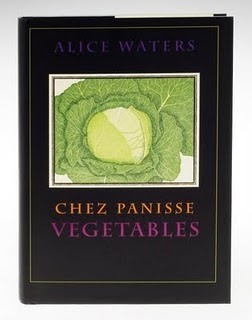 Chez Panisse Vegetables has been a sort of farmers market "bible" for me. When I first started going to farmers markets I kept reaching for the same vegetables I had conventionally used for years. I felt overwhelmed by the cornucopia of earthly riches as I reached past crisp daikon, funny looking fava beans, and brilliantly colored radicchio. Yes, I knew what some of these things were but I didn't know how to use them in the kitchen. Then this book changed my world. For over 25 years Alice Waters and her fabulous group at the innovative Chez Panisse in Berkley, California have dedicated themselves to serving the finest, freshest and simplest organic plates to their customers. Alice has proven that to make good food you must start with the best produce. She defines the art of simple food. In Vegetables, Alice teaches you everything from how to pick the best beets (they should be rock hard with rich green stems) and how early figs are best uncooked to informative trivia like how artichokes are actually the edible flowers of thistle and so on. All of these pearls of wisdom are folded into her deliciously simple recipes and arranged alphabetically by vegetable. With beautiful illustrations that pull at your heart strings, this book will send you running towards your nearest farmers market. Alice is an inspiration to many, but to me, with this book in hand you will always feel like she is right by your side.